I have asked a question, that I closed as a duplicate, one of those answers helped me a lot. And I don't think there should be to many "almost the same" questions out there. I asked this question: How can I read a single char from stdin without invoking bash? And "fess ." provided the perfect answer. I know there is a bounty-system, can I somehow award a bounty to someone on the "original" of the "duplicate"? I should at least award the 35 (10 upvoted and 25 accepted) reputation points, even if it comes out of my own reputation pocket (as soon as I can afford it). I ask him to duplicate his answer to my question. That would help those that had the same question more than them having to click the duplicate link, and then sorting out the one that also applies to other shells than ksh. Would that be the right way? This is Stack Overflow, you have several solutions; some are encouraged, others frown upon. Once you earn enough reputation points (75), you can set a bounty (50 or more) on the duplicate question. Rewarding an existing answer is one of the usual use case. It will surely show your appreciation; further more, it will show to other readers that this answer is somewhat special. Upvoting an answer provides 10 reputation points to its author. This is the common way to show appreciation. Comment the answer with a "thank you"
This is frowned upon since you do not provide additional information. Please don't unless you have an improvement suggestion to make. We don't like duplicates, please don't. This is not only discouraged, it is a case of serial voting and is disallowed on the stack exchange network. 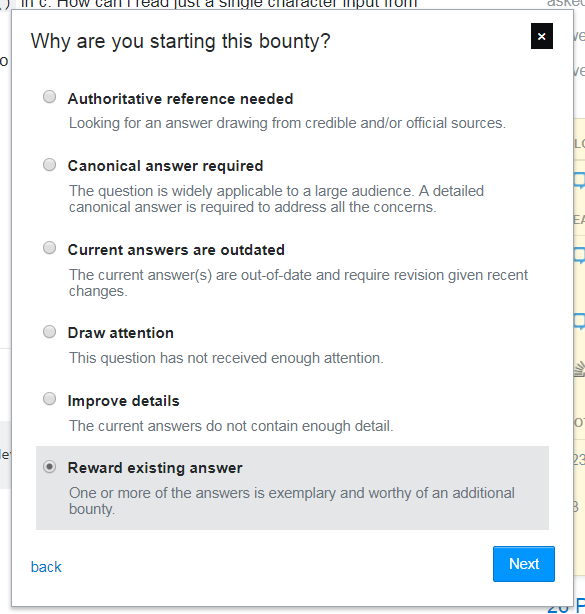 Bounty would be a good way to do this, but since you don't have enough reputation to o a bounty yet, you can't, you need 75 reputation to set a bounty, so in this case, best thing is only to up-vote him. Up-vote will work now, after you get 75 reputation, you'll get privilege to set bounties. you have to wait until 75 rep, so you can set a bounty, up-vote won't make much appreciation, since it is community wiki post, and the votes don't count for community wiki posts. fess. 's answer is not community wiki now, so can do anything you want. fess. 's answer is not community wiki, so you can up-vote it, and he'll get rep from from as usual, and also can set bounty as usual, so everything will be as normal as usual, bounty would be actually a good hit, show your appreciation. Not the answer you're looking for? Browse other questions tagged discussion duplicate-questions reputation bounty accepted-answer . How can I reward a user who helped me in the comments? Same question or not the same question? Should old questions that are marked as duplicates still lose reputation? Why didn't the answerer get my bounty? Answered a bountied question, answer is unaccepted and at -1, am I going to get that bounty?